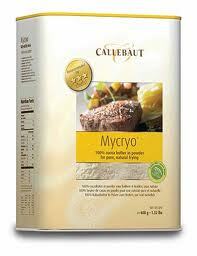 Mycryo is pure cocoa butter in dry, powder form, ideal for baking. Mycryo brings out the natural flavour of the ingredients, even the most delicate, and doesn’t mask the flavours as other frying fats do. Simply sprinkle the raw or slightly blanched ingredients with Mycryo and fry them in a hot, dry pan without additional fat. This 100% vegetable fat offers you all the health benefits from the cocoa bean too: no cholesterol, lower calories, less fat needed for frying. BUY DIRECT FROM THE DISTRIBUTOR & SAVE!